101st (Hv.) SS Pz. Btn. 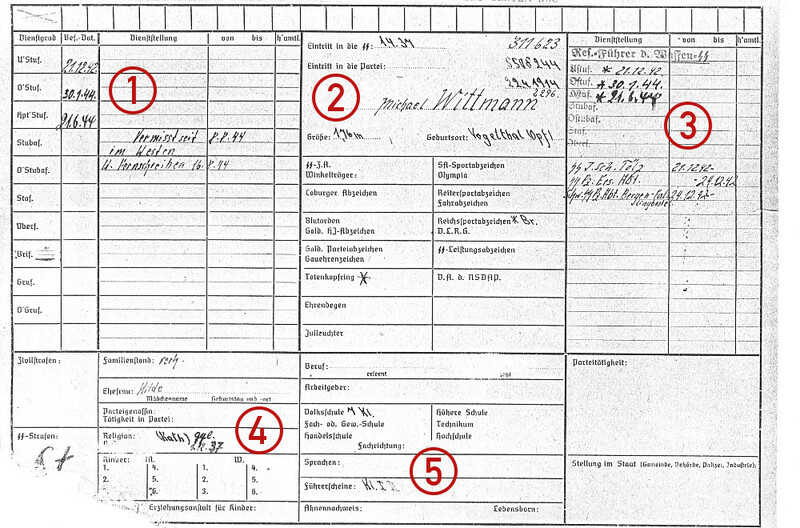 This is a summary of Michael Wittmann’s service record, held in his personal files. It lists all of key details, including promotions. It also includes a note of his being missing in action on 8th August 1944. The document has been divided into five sections to aid with the translation of individual items and notes. All handwritten sections are in italics. This section covers Wittmann’s promotions as an officer in the LSSAH. The chart allows for a progression up to the rank of SS-Obergruppenführer, and all three of Wittmann’s promotions are listed along with the dates. This section also contains a list of awards, most which are blank. The two that have been checked are Reichsportabzeichen (Reich Sport Award) with the annotation “Br.” for bronze. The Totenkopfring section has also been checked, confirming Wittmann’s receipt of the award following his commission in December 1942. Other awards listed are: SS Zivilabzeichen (SS Civil Award), Winkelträger (SS Honour Chevron), Coburger Abzeichen (Coburg Award). Blutorden (Blood Order), Gold. HJ-Abzeichen (Golden Hitler Youth Badge), Gold. Parteiabzeichen (Golden Party Badge), Gauehrenzeichen (District Honour Award), Ehrendegen (Honour Dagger), Julleuchter (Yule Lantern), SA-Sportabzeichen (SA Sports Badge), Olympia (Olympics), Reitersportabzeichen (Riding Sports Badge), Fahrabzeichen (Driving Badge), D.L.R.G. (Deutsche Lebens-Rettungs-Gesellschaft, German Life Saving Organisation), SS-Leistungsabzeichen (SS Performance Award), D.A. der NSDAP (Dienstabzeichen der NSDAP, NSDAP Service Award). Note 1. 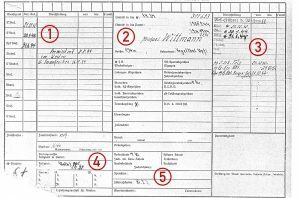 At no other point is there a record of Wittmann being a member of the NSDAP, and even on this summary sheet there is no actual date of entry. However according to other records he did eventually join the party in March 1938, with this membership number. Note 7. Funding and/or support for the Lebensborn (“Fountain of Life”) organisation. Chunky, sturdy, one pint beer mugs featuring the shields of all seven of the premier Waffen-SS Panzer divisions. As featured (somewhat inadvertantly!) in the Daily Mail. Perfect for that chilled Pilsner to accompany the Wursts from the barbecue! Sadly there's no more Panzer Ace forum, but we still have a couple of places on Facebook where you can get the latest site updates, share your views on the site and engage in discussion with fellow enthusiasts. We have a new Facebook page, as well as the well-established Facegroup closed group. You can find a number of themed Panzer Ace items in the Society6 Store, with every item in the collection created using custom designs. From t-shirts through to notepads and wall clocks, you can find the perfect gift for every Panzer enthusiast. Panzer Ace is a site for military enthusiasts, but occasionally we may get the odd visitor who has no idea what it is all about. 'Tis true! If you have any questions about the site - including some rather silly ones - check out our informative and entertaining FAQ! Help us keep the engine running! This site takes considerable time and effort to maintain and money to host, but will never charge for content... If you would like to contribute and keep the engine running, feel free!